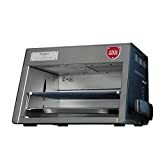 If you're ultra serious about grilling steaks and want to achieve perfect steakhouse level results right in your very own backyard in mere minutes, then fire up this cool new Otto's O.F.B. (Over-Fired Broiler) from Otto Wilde Grillers. 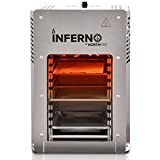 Unlike traditional grills, after only three minutes of pre-heating the dual overhead infrared burners of this unique grill, it reaches extreme temperatures of over 1500°F that can quickly grill tender and moist steaks that are sealed with a tasty gourmet crust on the outside (the Maillard Effect). 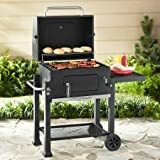 It features an easy to access front-loading open design, separately adjustable dual infrared gas burners on the top for direct, efficient heat distribution, a Clever Lever on the side for adjusting the cast iron grate height and opening bottles, and a removable grill top for easy cleanup. Check out this video to see this incredible steak grill in action. It even does pizzas and vegetables too! Guaranteed to grill steakhouse-caliber steaks! Experience steakhouse style grilling in your own backyard! Clever Lever is smartly fitted with a handy bottle opener, too!